For an organization that had once, not too long ago, prided itself on being one of the classiest in hockey, the Penguins have come to the point where they're dominating hockey news not for what has happened on the ice but for a personal tiff between their general manager and a local columnist. It has to be considered a low point for a franchise that has been setting new low points all year long. The team greatly embarrassed themselves last offseason during the search for a new GM and head coach, and they haven't even waited for the season to finish before getting started this year. This has been the season from hell for the Pittsburgh Penguins. They entrusted a man in David Morehouse who has no business directing a team's hockey operations, and he in turn entrusted a man who has no business being around a team with championship aspirations. Period. Not only have we seen the hockey ops already start taking a step back from where they were just a year ago, but the things that Morehouse was supposed to be proficient in - marketing, brand management, etc - are increasingly becoming an area of concern. The Penguins had to reportedly resort to drastic measures to ensure that they sold out Game 3 against the New York Rangers. Tickets were cheaper on the secondary market than at the box office. This latest incident is another black eye on an organization that is already rather unpopular outside of Pittsburgh. The brand isn't being tarnished, it's being dragged through the mud on its way to becoming a laughingstock. Further compounding the team's perception problem is that the local paper continues to throw journalistic ethics and good content out the window for cheap hits that would seem at home on the pages of a random tabloid. The Pittsburgh Tribune-Review is devolving into little more than an attention whore. Period. It doesn't matter if their sports columnist would fail an intro to journalistic ethics course, that his writing style is on the level of a high school sophomore, or that he's little more qualified to hold his position than Morehouse or Rutherford are theirs - he brings in the all-mighty page views, which brings in the all-mighty ad revenue, which allows this nonsense to continue. And we're guilty here too Pens fans - our need to hate this sad excuse for a sports writer allows this to continue. But when a former employee is taking his replacement to task, calling him a liar and unprofessional, you should start caring a bit more about your reputation and recognize just what you're allowing to go on. I barely click on Trib articles any more because it's not worth it to support the utter crap the paper allows to happen, and it's a shame because overshadowed at time are some writers who do some really excellent work. Josh Yohe and Jason Mackey continue to put out excellent work as beat writers covering the Penguins. But it almost becomes irrelevant when the one with the biggest platform has drowned them out this much. 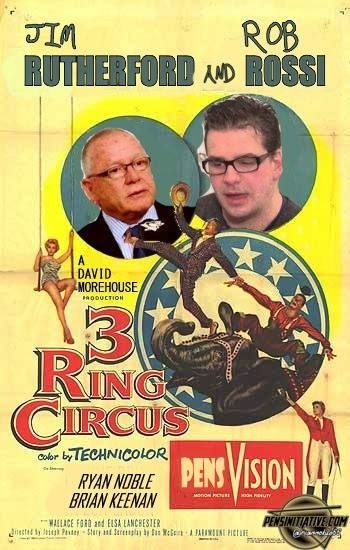 In less than a year the Pittsburgh Penguins have become a three ring circus. If it wasn't clear before, it's inescapable now - ownership needs to take stock of who's actually valuable then clean house of the rest. Given what's happened, the longer they wait to act, the more embarrassing this can only become. And after watching this play out this long, when does enough become enough?